Flashback Friday and I’m Drinking the Crewlade yet again!! It’s Flashback Friday! I love this JCrew Factory outfit from 2013!!! I just wish I was that skinny!!! One of my New Year’s Resolutions is to get in better shape. I’m Drinking the Crewlade yet again! 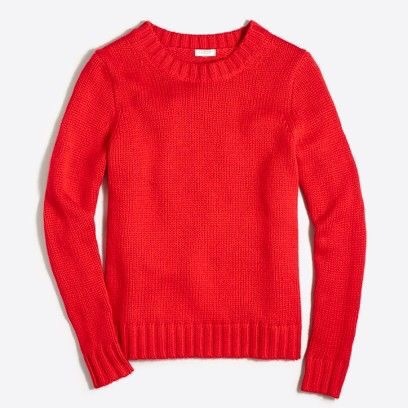 JCrew Factory is offering 40% off all clearance using code SHOPCREW. I purchased this Marnie Sweater in Belvedere Red, Light Thistle and Neon Azalea. I love this type of pullover. It’s very versatile. Neon Azalea is a color JCrew offers in many items every single year. It is a gorgeous shade of pink! I also bought a pendant necklace, which will go with everything!